The 2018 college football regular season is all but one Army-Navy Game away from being completed and it’s time to unveil our Conference Players of the Year for all 10 conferences across the FBS landscape. While staring in some games is one thing, these players dominated in seemingly every game they played and PFF’s play-by-play grading show just as much as each finished the year with elite PFF grades. 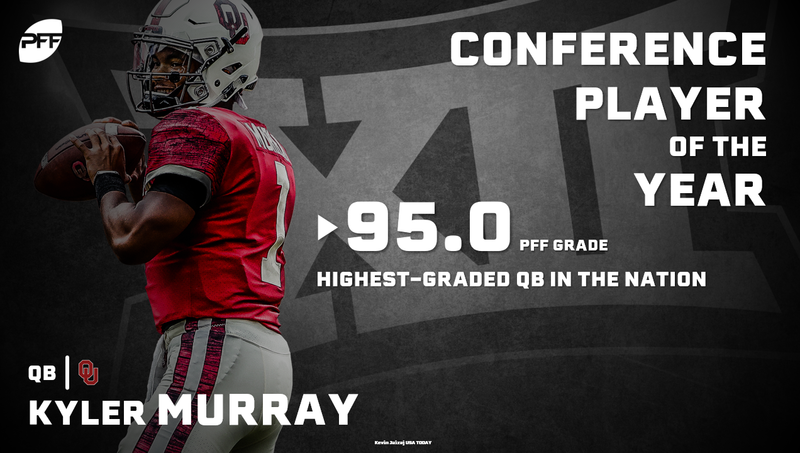 A familiar face standout as the Heisman Trophy frontrunner represents the Big 12 with Kyler Murray being the highest-graded offensive player in the entire country this season. While we outlined how Trevor Lawrence was the right quarterback for the Clemson offense when there was still drama over Clemson’s starting quarterback situation, Lawrence made us all forget that there even was a controversy over the position with his play in 2018. 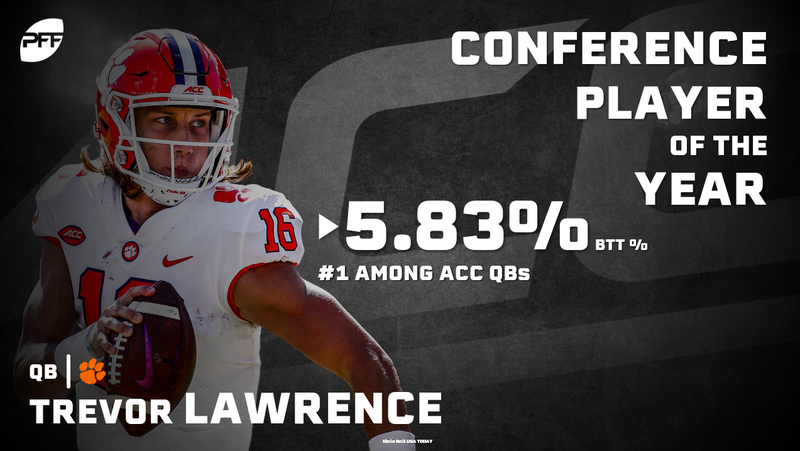 All Lawrence did this past season was lead the Tigers to a 13-0 record, change the Clemson passing game and take home the highest single-season grade for a true freshman quarterback in PFF College history. Lawrence’s arsenal of throws in his first season as an FBS quarterback is up there with the best in the country while his ability to avoid mistakes was the best. He garners First-Team All-ACC honors and was a unanimous selection among PFF College analysts for the conference’s Player of the Year Award. Look, we liked several quarterbacks over the course of the Big Ten season and as they say, the cream always rises to the top. Dwayne Haskins was the cream of the crop in the conference this season, setting Ohio State and Big Ten records in his path to the top grade at the position. 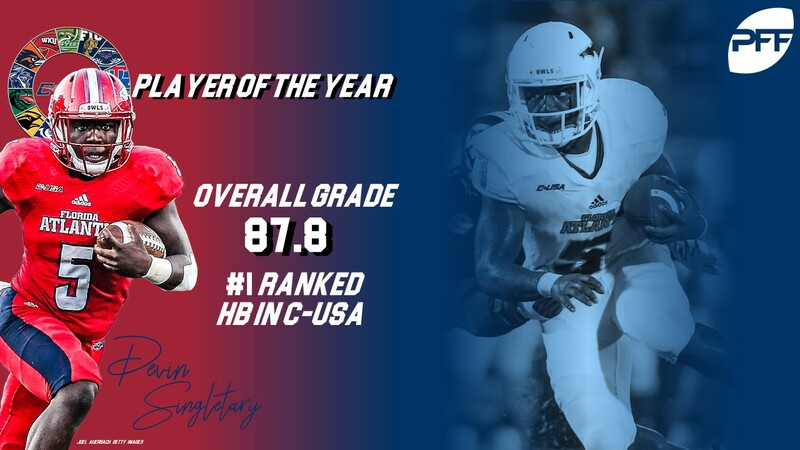 His ability from a clean pocket bodes well for him on a year-to-year level not only in college but also if he decides to take the leap to the pros as we’ve proven clean-pocket success to be highly stable in terms of transition to the NFL for a quarterback. Haskins led the nation in clean pocket touchdowns (40) and while he struggled under pressure during road games against Penn State, Purdue and Maryland, he put those woes behind him in the Big Ten Championship game. Against Northwestern, Haskins was under pressure on 19 dropbacks and completed 10-of-12 passes for 101 yards, two touchdowns and a passer rating of 141.3 as the Buckeyes cruised late against the Wildcats. While it was not enough for the College Football Playoff committee to look over their crushing loss to Purdue to join the national title picture, Haskins can cap his season off on a strong note with a Rose Bowl victory against Pac-12 Champion Washington. Not much more can be said about the season that Murray had for the Sooners so we’ll leave it with this: Murray has a case for the Heisman Trophy, the award given to the nation’s most outstanding player, that outdoes all his counterparts. So, was there ever really any question who would take home the best player in his own conference? 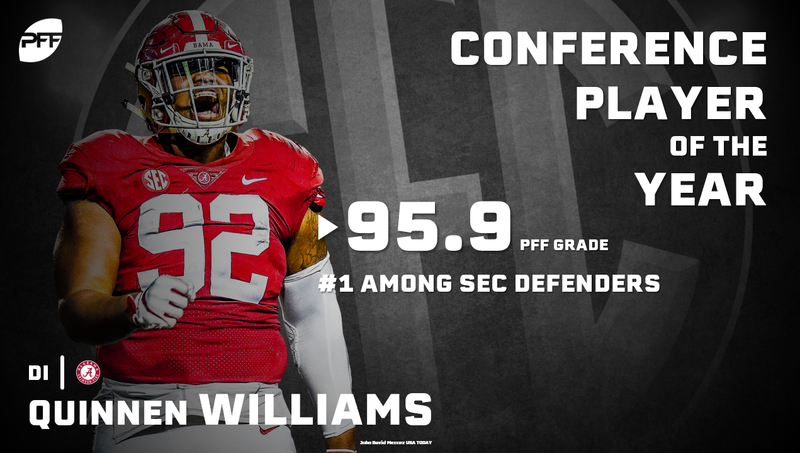 What Williams did in 2018 was extraordinary for the Crimson Tide. 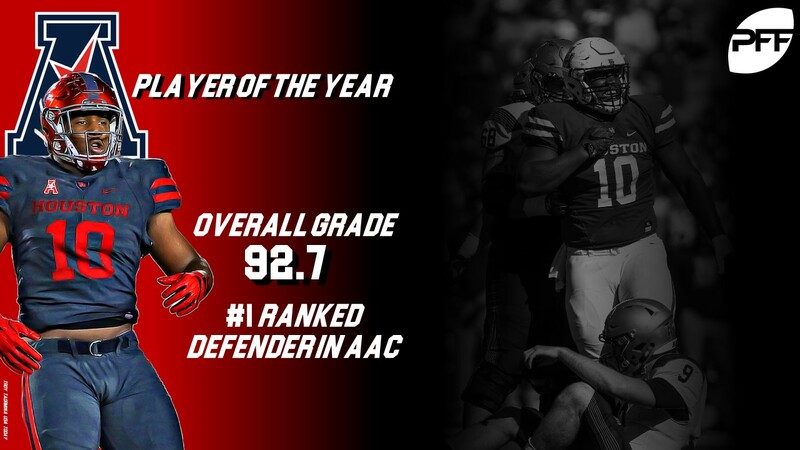 He entered the season as a small sample size talent and ended it with the highest ever grade that we’ve given to an interior defensive linemen in a single season at 95.7 (next closest was Maurice Hurst in 2017 at 94.4). Williams impressed both as a pass-rusher and as a run defender, despite just 151 snaps to his name before the season began. On 288 pass-rushing snaps. he recorded 43 total QB pressures that included nine sacks and 15 additional QB hits. He led the nation’s interior defensive linemen by winning 18.7% of his pass-rushing snaps this year while he was by far the nation’s best run defender at any position. He recorded 18 tackles for either a loss or no gain and made a tackle in run defense an average of just 0.96 yards past the line of scrimmage this year. Williams not only dominated, he went from a name only Alabama fans recognized to a household name to a potential top 10 draft pick in a matter of 13 games this season. There need be only one statistic to showcase the influence that Byron Murphy had on not only his team but also the entire conference this season. In the Pac-12 Championship, Washington and Utah combined for just 13 points and a single touchdown. 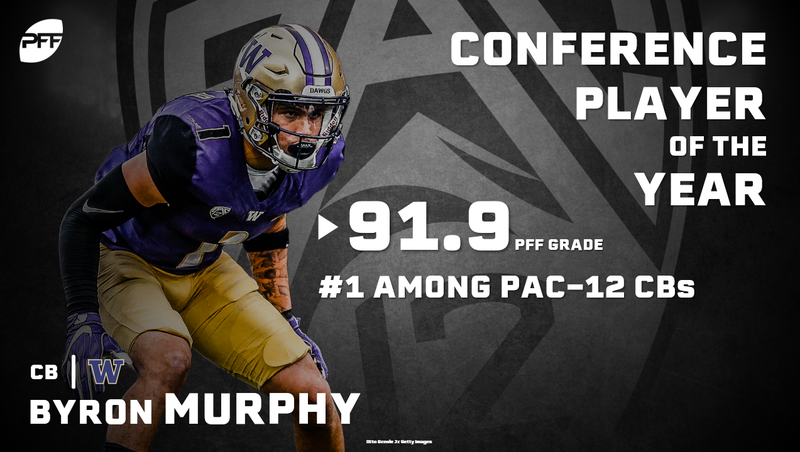 That touchdown was scored by Murphy on a pick-6 as he also grabbed another interception and limited quarterbacks to a 47.1 passer rating on throws into his coverage this season. His 18 total plays on the ball this year included four interceptions (all four over his last four games) and 14 additional pass breakups. On the season, he forced an incompletion on 28.3% of all targeted passes coming his way proving almost impossible to throw on for much success against some of the nation’s most talented signal-callers in the Pac-12. Long since a talented run stopper, Oliver increased his pass-rushing grade by almost 20.0 grade points in 2018, recording career-highs in overall grade (92.7) and pass-rush grade (88.4). While he didn’t set a personal record in total QB pressures with just 25 this year, he managed those pressures on 142 fewer pass-rush attempts in 2018 than he did when he set his career-best 27 pressures in 2017. Oliver trailed only Williams in run-defense grade among interior defensive linemen as well this season, giving him an astounding 117 run stops over the past three years. Singletary finished the season as the nation’s leader in most missed tackles forced on his carries, breaking 94 tackles on his 264 attempts. He gained 1,027 yards after the first contact with defenders this season, one of only three running backs to top the 1,000 yards after contact mark this year, proving just how hard he worked for his yards. In fact, of all FBS running backs with at least 170 carries, Singletary had to arguably work the hardest, gaining an FBS-high 76.93% of his yards after contact. All of the aforementioned reasons led to his fifth-highest run grade among running backs in 2018. 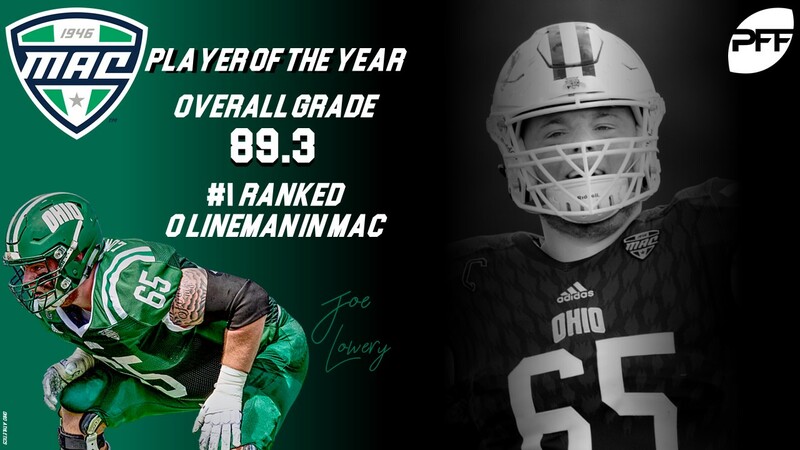 The Ohio offensive attack would not have been as successful had it not been for several players but one less-heralded player up front deserves more than his fair share of credit. Lowery was so dominant this season that he was our third-highest graded offensive tackle across the entire nation, dominating both with his pass-blocking as well as his run-blocking this season. Lowery allowed just nine total QB pressures on 334 snaps in pass protection as he protected Nathan Rourke’s blindside more than admirably. Rounding out his incredibly solid year, Lowery actually led the nation’s tackles with his 85.3 run-blocking grade, easily paving the way for Rourke, A.J. Oullette and the rest of the Bobcats running attack. Selected as the nation’s best tackler, Woodward didn’t let many opportunities to bring down the ball carrier slip past him in 2018, leading the nation in tackling grade at 92.4. He accumulated 108 total tackles and missed just three, leading the nation’s linebackers with at least 85 tackles in tackling efficiency. He was a menace to opposing offenses who flew around the field with great instincts and quick decision-making. 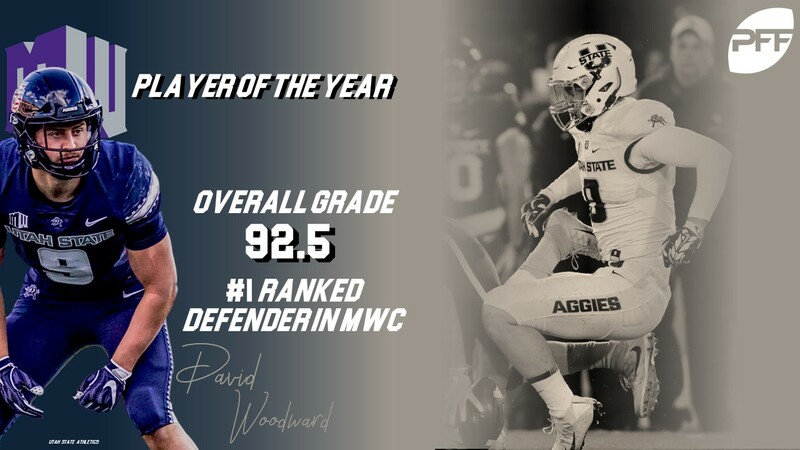 Woodward was named an All-American for his efforts and headlined our All-Mountain West team as well after finishing second in the country with a 92.5 run-defense grade and making 14 tackles either for no gain or a loss against the run. 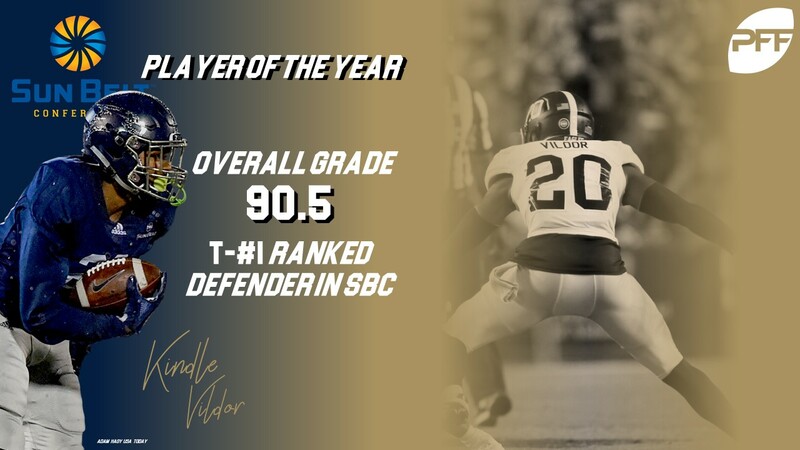 Sure, the Sun Belt had some impressive offensive performances this season but what Vildor did in coverage was downright impressive. Vildor spent 416 snaps in coverage this season and allowed just 31 receptions on the 56 targeted passes his way. He limited receivers and quarterbacks to just a 46.4 passer rating on throws into his coverage and ended the year with four interceptions and six additional pass breakups, forcing an incompletion on 17.9% of his targeted passes. Vildor did all of this despite being targeted once in every 7.0 snaps he spent in coverage and was no slouch against the run, but that’s a story for a different day. He finishes as the Sun Belt’s highest-graded defensive player after giving up just one lone touchdown this year.